Preparing for life with a new baby means many decisions. Among the cribs, bottles, and baby swings, you will want a good high chair. The thought of your baby sitting up on his own might not seem like an immediate concern, but it will happen quicker than you think. 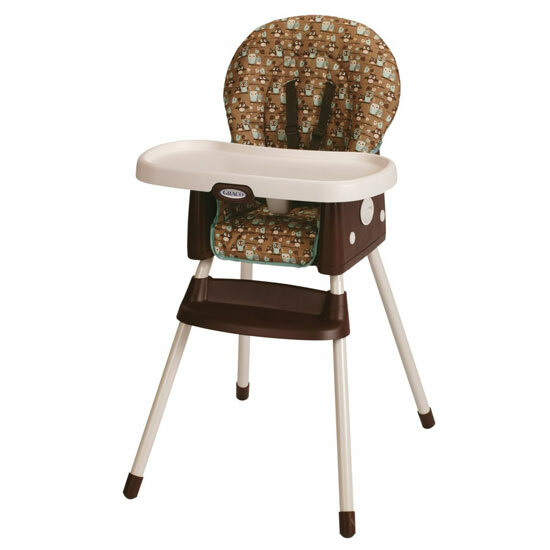 In addition, many high chairs are suitable for newborns to give new parents a safe place for their baby. 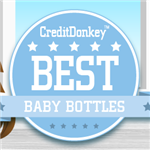 The more prepared you are to keep your baby occupied and safe, the better. Every baby is different, but in general, they learn to sit on their own between 4 and 7 months old. As soon as your baby hits this milestone, he will want to see what goes on in the world around him but since he cannot sit in a grown-up chair, the high chair is the safest choice. Do You Really Need a High Chair? Many parents wonder if the high chair is just another useless purchase they will regret after a few uses. Typically, though, the high chair is one purchase most parents appreciate. If you spend any time in the kitchen cooking and cleaning, or you like to sit down to dinner as a family, the high chair will be an invaluable purchase. Think of it as a place to keep your baby safe while enabling him to see the world around him. Height. High chairs come with different height adjustments. If you have a specific area where you will use the high chair (which is different from the standard table height), you need to determine if the chair adjusts high or low enough for your needs. Suitable Age. High chairs are not a one-size-fits-all product. Some chairs hold infants safely while others strictly hold toddlers. If having your newborn at the table with you is important, you need to find a high chair with the appropriate level of reclining for safety. Ease of Cleaning. High chairs range from basic plastic chairs, which wipe down easily, to chairs with fabrics and nooks and crannies. This means more time-consuming cleaning. Think of how much time you wish to invest in this chore when you search for the right chair. Convertibility. Consider whether your purchase will get you through the infant and toddler years or if you will purchase a larger chair in the future. Most high chairs have the ability to adjust and some even convert to a booster. Knowing your plans can help you choose the right chair. Portability. Not all high chairs are portable. If you know you will visit grandma’s house a lot or you like to travel, you need portability. Look for lightweight high chairs with the ability to fold for easy transport. Footprint. The space you have for the high chair makes a big difference too. Are you in a small apartment where space is a commodity? If so, you could benefit from a high chair which folds up for storage or one which you can attach to the counter, saving valuable floor space. Safety. 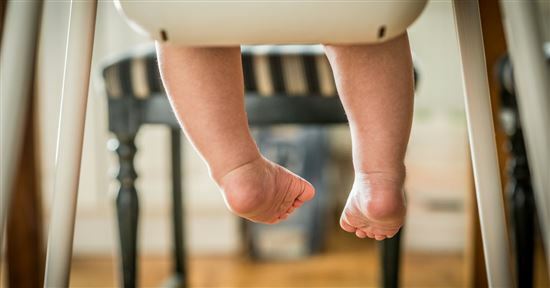 High chairs have to have certain safety features, including a locked-in tray, appropriate safety straps to prevent sliding and/or climbing out, locking devices for folding high chairs, and a wide base to keep it stable. High chairs must meet the ASTM International Standards for high chairs, but parents should still evaluate the safety features provided. If there is one large investment you make for your baby, the Peg Perego Siesta High Chair should be a consideration. While it is a pricier option than most, its features and capabilities put it in a category all its own. We love the reclining features on the Peg Perego Siesta High Chair because it has five positions you can choose from, including a full recline. When you use this setting along with the lowest height adjustment, you have the perfect, portable, napping spot for your baby. In this position, you can easily move your infant from room to room with you as you complete your chores with the help of the easy to maneuver wheels on the Peg Perego. We also love the secure safety features, including a five-point harness and the easy to apply brakes – you control them from the top of the high chair. This means no more bending down to lock or unlock brakes – talk about a back-saver! The comfortable fabric keeps your baby happy but it is also easy to clean with a damp cloth, making cleanup a cinch! One thing we noticed about the Peg Perego Siesta is the complicated features. For new parents trying to figure everything out while handling a fussy baby, it can be a little overwhelming. We recommend setting the high chair up before you need it so you can get familiar with its features when there is no stress. Another downside to this high chair is the amount of space it takes up. If you have limited space in your kitchen, this chair might be too roomy. It weighs 25 pounds, which can also minimize its portability. This high chair is a great product for parents of infants or toddlers, as it safely holds infants while adjusting with your quickly growing toddler. Because of its higher price tag, the earlier in your child’s life you purchase this chair, the more return on your investment you will obtain. 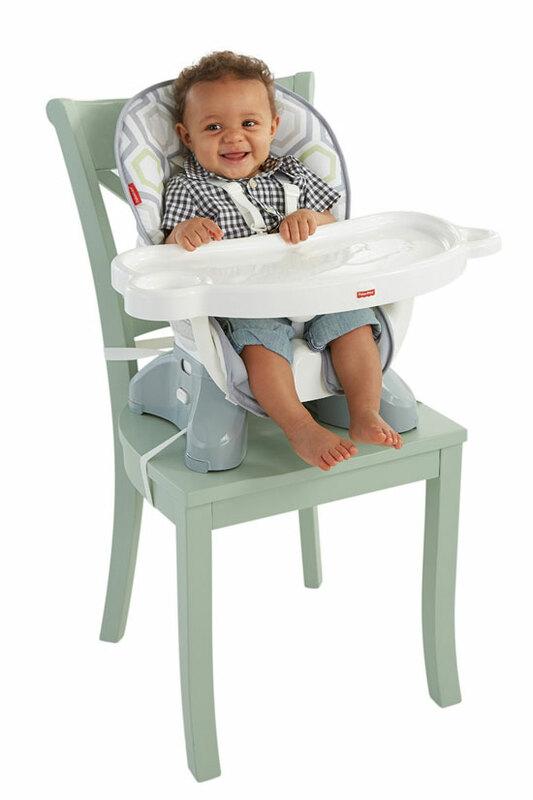 If you see yourself transporting your baby from room to room with you or spending a lot of time in the kitchen, this high chair is a great way to keep your baby comfortable and safe. When we searched for the right high chair for a toddler, we wanted one we knew could grow with a child. Toddlers still need the safety of the high chair until they can safely sit at the kitchen table with everyone else, which could mean well after their 4th birthday. We found the Graco SimpleSwitch High Chair to be the best choice. Our favorite feature on this high chair is how easy it converts into a booster seat. Independent toddlers who want to be a part of the action will quickly start protesting sitting so far away from the table in a high chair. This does not mean they are ready for a regular chair, though. This is where the benefits of the SimpleSwitch come into play – the high chair easily switches into a booster seat with a 3- or 5-point harness, depending on your child’s needs. We also love the simple design of the tray – you only need one hand to remove it from the high chair, freeing up your other hand to secure your toddler in the seat. It also accommodates weights up to 60 pounds, which gives you more flexibility as your toddler grows, enabling you to keep him secure longer. We found the footrest to be stagnant, which could become a problem if you have a taller toddler. We also found the straps slightly difficult to adjust, which if you have a squirmy toddler, could be an issue for you. Lastly, the high chair does not fold, which can cause space problems in your home if you have a small area for the high chair. It also removes the possibility of transporting the high chair while you travel, unless you transform it into a booster seat. Who Should Use This High Chair? If you are a family on a budget and you do not need to have a portable high chair, this Graco SimpleSwitch High Chair is the perfect choice. You receive two chairs for the price of one and it can stand the test of time. If you know your toddler cannot handle sitting in a booster without straps at the kitchen table and would benefit from the high back of the booster seat on this high chair, this is the perfect choice for you. If you have a small kitchen, the thought of adding a high chair might make you cringe. Where are you supposed to put it? 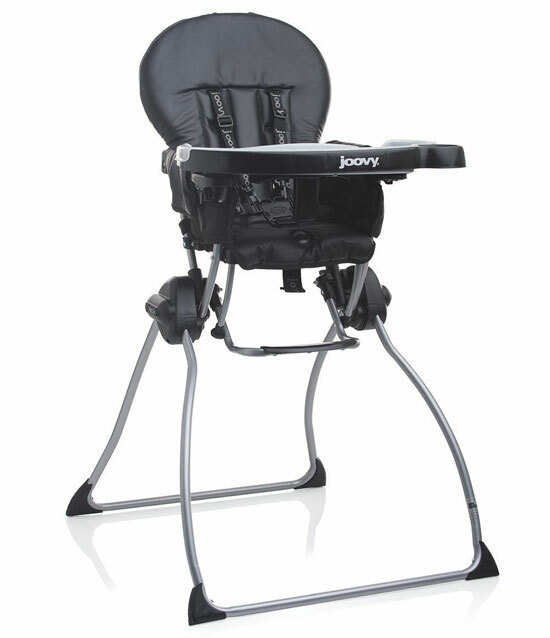 Luckily, the Joovy Nook High Chair has your back. This super compact high chair may not have an incredible amount of features, but it rewards you with its small footprint. What we love the most is how flat the high chair folds – and it even folds flat! You can literally store it in the tightest spaces. We also love the ease of which you can clean this high chair. The leatherette back wipes clean with just soap and water and you can remove the fabric seat for machine washing. When the tray becomes too dirty, you can wash the top portion of the tray in the dishwasher for deep cleaning. For safety purposes, the swing tray caught our attention, as it allows you to have both hands available for a squirmy baby, rather than juggling a tray in one hand and a baby in the other. Aesthetically speaking, this high chair is as simple as they come, which is perfect for contemporary or modern homes. There are no baby prints or even odd color choices – black, white, or green leatherette are your options. Because this high chair is simplistic in design, you do not get many bells and whistles. Namely, you cannot adjust the height of the high chair or change its position. You also cannot adjust the footrest, which is low enough so most children do not reach it until they are well into their toddler years. The space between your child is a little larger than other high chairs offer, which could mean a larger mess for you to clean after your child eats. This minimalist high chair is the perfect choice for parents with little space in their homes or even as a second high chair for a grandparent’s home. Babies 6 months and older can sit in this high chair safely and it holds children up to 50 pounds, which brings most toddlers into their 4th year. If you prefer a high chair with a small footprint and do not need an adjustable height high chair to accommodate your child for counter eating or other adjustments, this is a perfectly affordable and attractive high chair. The portable high chair is an asset for families who travel, visit relatives, or do not have a lot of room in their kitchen to store a high chair. The word “portable” does not take away from the benefits of this baby product, however. The Fisher-Price SpaceSaver gives you all of the same features as a fully loaded high chair, but without the legs, giving you the portability and small footprint you desire. When you think of portable, less functional probably comes to mind. With the Fisher-Price SpaceSaver, however, you get everything you need along with portability. This high chair is suitable for young infants all the way through toddlerhood, which is why we love it. Once you attach it to a kitchen or dining room chair, you can easily recline the seat into one of the three positions. This even makes bottle-feeding a cinch at the table. If you have a toddler, you can keep it in the straight-up position for the most comfortable seating. We love the longevity of this high chair as it converts into a booster seat once you remove the tray, seat back and seat cushion. We also love the cleanliness this highchair provides. If the tray needs more than a quick wipe down, you can detach it and put it in the dishwasher. One downside we found with this high chair is the fabric pads. Typically, they need more than just a quick wipe down, which means more loads of laundry for you throughout the week. We also found concern with the straps, which secure the portable high chair to the kitchen chair. Adults need to check the straps each time before placing the child in the seat to ensure its safety. This makes a little more work for parents, but it is worth it for the safety of the child. Portable high chairs have many uses, which means many families benefit from them. If you are a family that travels or dines out often, this high chair could accompany you on your travels. This diminishes the need to use public high chairs and booster chairs, which are usually dirty and contain unknown germs. Even if you don’t travel, though, yet you have little room to comfortably place a high chair, this portable Fisher-Price chair could meet all of your baby’s feeding needs from infant to toddlerhood and even beyond. Because it is not overly expensive, it is a great chair to have stored away even if you have a full-size high chair at home, because you never know when a portable chair will come in handy. When your toddler outgrows the highchair but is not quite ready for a big kitchen chair, you need something to boost him up. The OXO Tot Nest Booster Seat safely provides the boost your child needs. With a three-point harness buckle in the seat and secure straps, which adjust to accommodate any size chair, this seat is a safe and aesthetically pleasing choice. All it takes is a quick wipe down with soap and water to keep the seat clean, and its minimalist design makes it easy to take with you when you are out and about. Sometimes all you care about is the cleanliness of the high chair. With crumbs, purées, and other foods meeting your child’s cute, chubby hands, a mess is inevitable. For parents who want simple cleanup, the OXO Tot Seedling High Chair is the perfect choice. It still has all of the features you need, such as adjustable legs and 3 reclining positions, but it also allows for simple cleanup. The stain resistant fabric can fight most messes with a simple wipe down with soap and water. For the heavy-duty messes, though, you can detach the fabric and throw it in the washing machine. If your family prefers to eat their meals at the island in your kitchen or you have a pub-style table, a standard high chair will not work. Your baby or toddler wants to be a part of what you guys do, which is why the Graco TableFit High Chair is a great choice. With 8 adjustable height positions, you can easily find the perfect position for your child. In addition, this high chair offers a unique, yet slight, slope enabling you to position your child right at the edge of the table, rather than having a tray in between him and the table. This is perfect for those children who want to be a part of the action! High chairs are not just for toddlers feeding themselves; they are a great way to have your infant with you when you eat too. It can help you bottle feed babies who need a slight recline or give them a safe place to sit while you cook or clean the kitchen. The Graco Blossom 4 in 1 High Chair grows with your baby and is perfect from infanthood into toddlerhood. It has 3 reclining positions and extra removable support for your infant’s head and body to ensure his safety. As an added bonus, the chair converts into a booster for toddlers and even a youth chair, giving you many years out of your purchase. Sometimes parents need the convenience of rolling their child from room to room or even different areas of the kitchen. 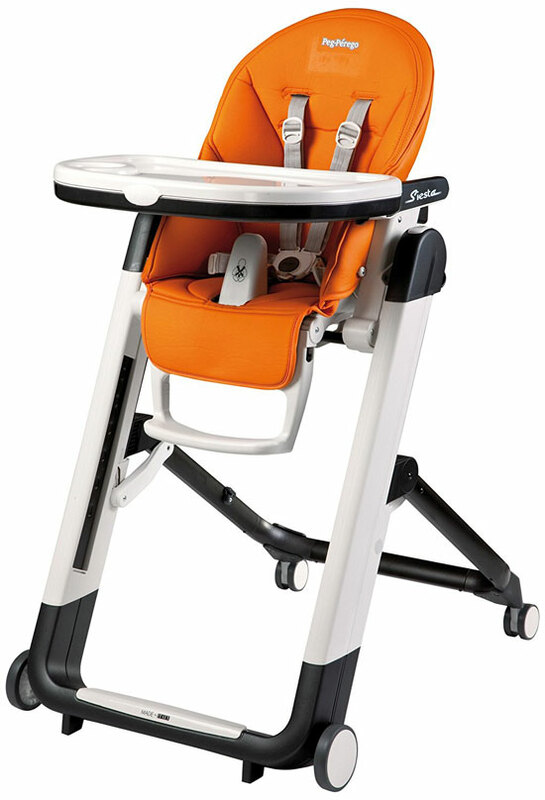 The Chico Vinyl Polly High Chair offers this ability with four wheels that securely lock in place. Because there are 4 wheels rather than 2, your floor remains scratch free while you easily move your child from place to place without disturbing him. In addition, this high chair grows with your baby through toddlerhood; it holds up to 37 pounds. It also has an adjustable footrest and a larger tray than most high chairs, giving your baby plenty of room to explore his food. At CreditDonkey, we hope this research helps you narrow down the overwhelming decision of choosing the right high chair. Every family has different needs based on what your baby prefers as well as what products you want in your home. Since your child might use the high chair for 3 or 4 years, it is an important investment. In order to avoid disappointment or the need to purchase another one in the future, do your research ahead of time to find the right chair for your child. Share on Facebook "Best High Chair"